Aselsan has begun the serial production of 35-mm airburst rounds – designated ‘Intelligent Particulate Ammunition (ATOM)’ – and other systems for Korkut self-propelled anti-air gun (SPAAG) systems ordered by the Turkish Armed Forces (TSK). 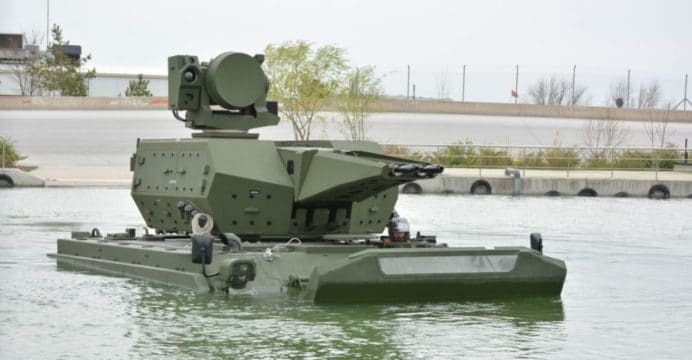 Turkey’s Undersecretariat for Defence Industries (SSM) and Aselsan signed the production contract at the end of last year, with Aselsan announcing that it has begun production on January 15. Aselsan completed the ATOM’s live-firing trials in 2015, claiming successful interception of various air-to-ground missiles (AGM). The Korkut SPAAG is meant to counter incoming AGMs and low-flying aircraft, such as cruise missiles and unmanned aerial vehicles. The Korkut SPAAG uses twin-barrel 35-mm cannons, which are Rheinmetall Air Defence KDC cannons built under license in Turkey by the Mechanical and Chemical Industries Corporation (MKEK). Its guidance suite comprises of a 3D search radar and electro-optical (EO) pod mounted on a command-and-control (C2) vehicle. The Korkut’s C2 suite, radar, EO and fire-control system are manufactured by Aselsan. The Korkut SPAAG – along with Roketsan’s HİSAR-series of short and medium-range surface-to-air missile (SAM) systems – will function as the Turkish Army’s low-level air defence system. Mobility is a key aspect of this suite, thus the Korkut and HİSAR will be deployable using tracked armoured vehicles, indicating that this air defence system could accompany tank and infantry fighting vehicle formations.